Half way through TrekWest, 2500 or so miles into a journey we expect will be about 5000 muscle-powered miles, I enjoyed a welcome rest at the capacious and comfortable High Lonesome Ranch in western Colorado. Buffering and bounded by the Book Cliffs and other big public wildlands, High Lonesome may come as close as any ranch in the West to embodying the principles and values of good land stewardship that we as a country must embrace if we are to see our natural heritage safely through a century of climate change and diminishing resources. 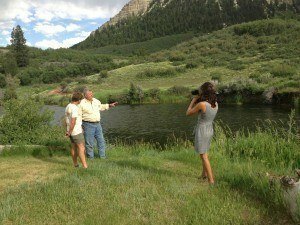 HLR co-founder Paul R. Vahldiek Jr. (pictured with me and a reporter below) and his team are striving mightily to show that a private working ranch can serve the needs of wildlife even while providing jobs for local folks and recreation opportunities for visitors. Their mixed use and conservation effort is still growing, the ranch pieced together over time from acquisition of private lands and retention of leases on adjacent public lands. At the forefront of a trend among large private land-owners in the West, High Lonesome Ranch continues to raise livestock but at lower numbers than permitted, which allows recovery of natural vegetation, and attracts other sources of revenue by offering nearly four hundred square miles of wild country, with the most luxurious base camp you’ll ever visit, to hunters, fishers, mountain bikers, hikers, wildlife watchers, and scientists. Yes, science along with recreation. Indeed, where HLR really distinguishes itself from other examples of good private land stewardship in the West is by hosting ongoing scientific studies on topics ranging from sage grouse nesting habits to the effects of elk browsing on aspen regeneration. In fact, part of what started Paul down a conservation path was seeing the iconic aspen trees dying from, he would gradually realize, a combination of over-browsing by elk–a consequence of eradication of wolves across most of the West—drought, and perhaps long-term climate change. 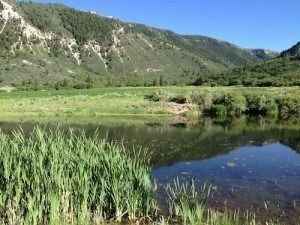 When Paul figured out that there had been essentially no aspen regeneration since wolves had been eliminated from Colorado decades before, he had his epiphany on the importance of the full range of wildlife and the need for big wild interconnected habitats. His epiphany blossomed into a lifelong commitment to protecting the wild Rockies when he met Society for Conservation Biology founder and Wildlands Network co-founder Michael Soulé, and heard Michael’s passionate call for rewilding the Spine of the Continent. Paul and his family and staff were further strengthened in their commitment to conservation ideals as Cristina Eisenberg, author of The Wolf’s Tooth (published by Island Press and one of the best books on trophic cascades) conducted studies on High Lonesome Ranch and beyond on the role of top predators in natural ecosystems. Now Paul and ranch manager Scott Stewart and team intend to expand the role of science at The High Lonesome Ranch by creating a state-of-the-art, and state-of-the-science, research and teaching institute, centered two valleys north of the small area occupied by their always elegant but never ostentatious guest lodges. Applied science here will look at questions pertaining to the full biota of the area and to what sorts of uses of the land and water are compatible with wildlife. 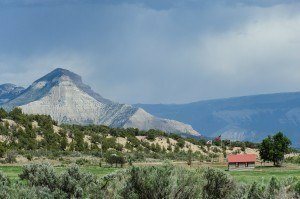 High Lonesome Institute will be a leading non-profit academic institution, but The High Lonesome Ranch is an operating business and needs to make at least modest profits to be sustainable over the long term. So Paul is looking at how to conduct modest amounts of livestock and energy production on contained parts of the ranch without diminishing the ecological health of the whole—indeed, while restoring ecological health to the whole, for much of the ranch was suffering from decades of overgrazing when Paul and fellow investors pieced it together. The TrekWest stop at High Lonesome was important in part for its bringing together of wilderness advocates and mixed-use, conservation-minded land-owners. Some of these conservation-minded landowners have begun to band together to assist other families and working lands businesses in keeping their lands intact. Everyone who knows me well knows that deep down, I wish most of the world were wilderness, with we meddlesome humans domesticating only small carefully contained areas—a world of small gardens and big wilderness, as my writer friend Paula Mackay, co-founder of Wild Farm Alliance, has poetically put it. My friends know I’d much rather see big wild native animals than cows or sheep, East and West. I reluctantly accept, though, that we humans are too many for the world to be predominantly wild. Being an order or two of magnitude too large in population and consumption levels, in terms of carrying capacity, we 7 billion humans are devouring the planet’s resources and space. Many of the places I wish could be Forever Wild will inevitably continue to provide food and other resources for our ravenous appetites. Best that we agree to set aside big wild cores connected by wildlife corridors then learn how to gently use the compatible use zones, such as carefully worked ranches that often lie adjacent to cores, in ways that support human economies but also allow wild animals room to roam. That intersection of wildlands and carefully stewarded lands is the terrain High Lonesome is exploring. At least fleetingly, I too am treading there more and more often, looking for ways that might meet the needs of all native species and local economies, too. Having recently crossed the half-century mark in age, and having hiked, biked, paddled, skied, and rowed nearly 15,000 miles in the last three years (much of it through privately owned conservation lands) to scout potential wildways, I’m ready to work with anyone who cares about the natural world, even if they may favor heavier uses than I’d prefer. I’m more than ready to work with, and celebrate, conservation-minded landowners like Paul Vahldiek and his team at The High Lonesome Ranch. I want to help them make sure the place stays Exactly as Wild as You Want (their tagline) for not only the human visitors but for the permanent residents, with two legs or more, with wings, with fur, with feathers, with fins. Thank you photographers: Publicist Kelly Diedring Harris, Professional photographer Mark Lance, Board President Susannah Smith (also for featured the video too!) and Wildland Network Strategic Director, Kenyon Fields.